Tender To, a stunning 27m Leopard (Arno) showcases sophisticated style, speed and stellar performance all combined to make the perfect luxury charter yacht in the Leeward Islands. 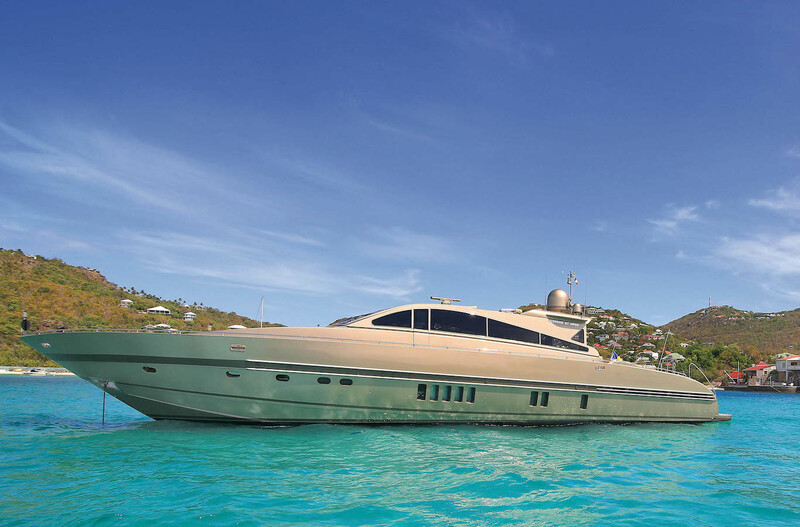 Built in 2005, she was recently refitted in 2015 and boasts golden exteriors making her stand out versus other yachts in her category. Tender To can accommodate six guests in three well-appointed cabins. Tender To’s salon features light and modern furnishings, which create an elegant and fresh atmosphere. A winning feature of the yacht is her retractable deck head; the roof opens and transforms the room into a unique exterior salon, which can work as an extension of the aft deck. The dining table can comfortably seat eight guests, who can enjoy watching the captain maneuver the yacht if they choose to. There are three cabins on the lower deck, including two double cabins and a twin cabin all with ensuite facilities. The staterooms are particularly spacious for a yacht of this size and are impeccably maintained. Tender To features large aft decks and boasts plenty of open spaces for lounging and relaxation. The yacht also has a seating area in the forward deck; the perfect place for a day in the sun surrounded by beautiful crystal clear waters. Her list of toys includes two paddle boards, a Tender and Snorkeling equipment. Her deep V hull, enables her to cruise smoothly making the yacht seaworthy and one of the best choices for a yacht charter in the Leewards Islands. Tender To is also perfect for day and static charters. Her professional crew of three, will show guests the true meaning of Caribbean hospitality, and their local knowledge will ensure you have a wonderful Caribbean charter experience.